A couple weekends ago, I took my buddy Sluggo and his ladyfriend out to Long Island for a few short l'il nature hikes. That evening, before we headed back to Brooklyn, we stopped by my favorite restaurant, Hicksville's New Chilli and Curry. As I've mentioned before in Meal Corner, there are A TON of fine restaurants right in this general area, among them Choopan Grill (Afghan), Masala Wok (Indian / Chinese), and the recently shuttered Curry Club (R.I.P.! For the record I've eaten at Curry Club's successor - the name escapes me at the moment - for lunch and it was quite good.). But New Chilli and Curry has them all beat, as evidenced by the literally out-the-door line of people waiting to dine there. I have to admit I hadn't here in quite some time, so I wasn't aware as to how incredibly poplular it's apparently become - congrats to them on that! But yeah, I've had a ton of great meals here, even if it hadn't been a while. The first time I ate here, I basically asked them to make me the spiciest thing on the menu, and they obliged; they also made me two small items - off the menu and free of charge - challenging my tolerance for spicy stuff. One was an amped up chili sauce and the other was a small pickled salad of sorts which pretty much leveled me. I've enjoyed every meal I've ever had here, and the service somehow manages to be just as great as the food. Kumar and the other waiters always do a great job. I almost hesitated to include the above pics, which truly aren't terribly appetizing, but you'll have to take my word that the food is very visually appealing when it's served. The top photo shows our entrees; Sluggo and his better half got daal, palak paneer, and a delicious, buttery chicken dish which may not be on the menu, and I got the chilli hakka chicken, which is an old favorite. Next picture down the drums of heaven, which are scrumptious; next pic is the tom yum soup (VERY nice and spicy) and not pictured are the plateful of shrimp pakora that I wolfed down. Everything was off-the-charts insanely awesome. I've eaten here so many times that I can eagerly recommend a few more dishes, including the vindaloos, anything with a black pepper sauce, and their curries. Their lunch buffet is also probably the best in town, which is impressive considering how many local joints do that pretty well. Lookin' for flavor? Well you don't need to worry. 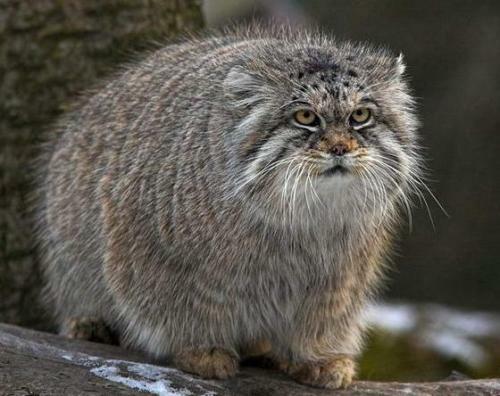 I like Pallas' Cat, it's very furry.